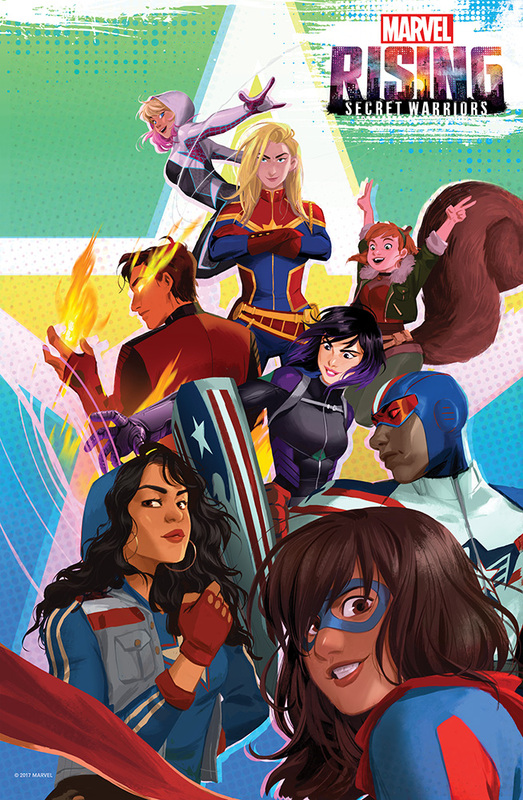 Marvel Rising is a new animated franchise from Marvel Animation starring the next generation of heroes: Ms. Marvel, Squirrel Girl, Inferno, Patriot, America Chavez and Quake. I have had the honor of helping launch this new franchise by writing a movie, a 22-minute animated special and a series of shorts that are all available to watch on the Marvel HQ Youtube channel. Start with Marvel Rising: Initiation, a series of animated shorts, which introduce Gwen Stacy, aka Ghost Spider, as she tries to clear her name by catching the criminal who framed her for the murder of her best friend. Along the way she’ll meet new super heroes, Squirrel Girl and Ms. Marvel, and S.H.I.E.L.D. agents, Quake and Patriot. Then watch Marvel Rising: Secret Warriors, a full-length animated movie, which follows Ms. Marvel and Squirrel Girl, as they discover a secret Kree plot to take over the world with Inhuman soldiers. Along the way they’ll need to recruit Inferno and America Chavez with help of S.H.I.E.L.D. agent Daisy Johnson, aka Quake, and her partner, Patriot. Together, they’ll form the Secret Warriors, Marvel’s next generation of heroes. 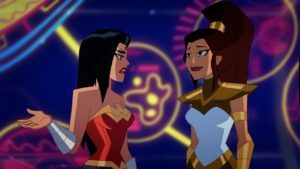 Finally, watch Marvel Rising: Chasing Ghosts, a 22-minute animated special, where Ghost Spider returns to action hot on the heels of her nemesis, Sheath, but finds that she’s not operating alone, Sheath’s’s teamed up with Exile, a powerful Inhuman. When the Secret Warriors show up chasing Exile, Ghost Spider will have to learn to work with the team of young heroes to defeat them and possibly clear her name with the chief of police, Captain Stacy, her estranged father. I haven’t done a general news update in a bit so I thought I’d talk about some upcoming projects. On the TV side of things. my Justice League Action episode, “The Trouble with Truth” just aired starring Wonder Woman, Batman, Green Arrow and Athena. It was wonderful telling a story about Wonder Woman and her relationship to the Gods. Check it out if you have a chance. Also Athena gets a magical-girl-style transformation which is just awesome. I’ve been consulting on season 2 Marvel’s Guardians of the Galaxy cartoon and a bunch of my episodes have been airing. Check out a clip of one of my recent episodes here. On the comics side of things, I’m co-writing IDW and Hasbro’s big summer crossover event, First Strike, with David Rodriguez. Max Dunbar is drawing this one with colors by Ander Zarate and letters by Tom B. Long and it looks amazing. 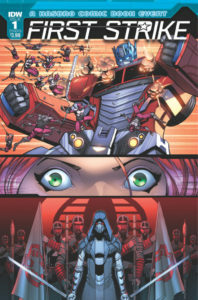 In the event, Baron Ironblood leads a group of the worse villains from the Hasbro multiverse in a quest to destroy Cybertron and it is up to Scarlett and her G.I. Joe team to stop him with help from Optimus Prime. Issue 0 was just released and can be read for free here. I also have two graphic novels being released by First Second books in early 2018. The first book is part of First Second’s educational Science Comics line and is called Robots and Drones. Jacob Chabot provided the art and did a great job bringing all these incredible robots to life. I have never done so much research before in my life. This will be a great read for any youngsters interested in robotics. 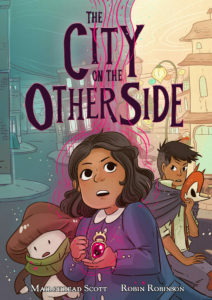 The second book is an original graphic novel called The City on the Other Side that I co-created with artist Robin Robinson. This book follows a young girl who discovers a magical artifact and gets pulled over to the fey realm hidden within early 1910s San Francisco. Robin’s art is beautiful and this all-ages tale will spark the imagination with its inventive depictions of fairies and magic. So it’s been a fun year and 2018 will be even cooler. My next convention appearance will be San Diego Comic Con and I will be posting my schedule a few days before the show. As I decide on my schedule for the second half of the year, I’ll keep you up to date here. Transformers: Till All Are One wrapping up with issue 12 and an Annual. I should have written this a while ago, but I wanted to wait until after Issue #10 because it was such an important issue for me, a triumph of our series. And I think it truly is a triumph. It’s difficult and uncomfortable and still very compelling. This is in big part thanks to Sara’s amazing art and Joana’s amazing colors. So now I’ll say it. We’re cancelled. We were asked if we wanted to do something to shake things up (shift focus, shift cast, shift story) after the First Strike event, which is also normal, but I didn’t. I love Transformers, but I’ve been writing it for literally years and I wanted to tell this story. So rather than think of a new story I didn’t love as much, I just chose to end us here. Till All Are One will go to Issue 12 and then an annual will be put out late 2017/early 2018 to wrap up any loose threads. A thousand thanks to our editor, Carlos, for giving us that much-needed space. A thousand thanks to Sara and Joana and Priscilla and Tom and John and Meg and Jason and all the people I know I’m forgetting and shouldn’t. Issue 11 and 12 are going to be awesome by the way. I think we crafted a really satisfying, positive ending emotionally and the annual puts that needed cherry on top. We did something I never thought I’d be able to pull off that I’ll talk about more when it’s released. The Combaticons. Think about it. These guys DON’T HAVE FACES! (Well, Blast Off does) and she makes them so expressive without making it seem like she’s cheating their designs or making them cartoony. I had to keep writing them! -An issue of Titan’s Return just about the Maccadam’s Crew having to defend the bar from being smushed. -Lightbright and Sparkstalker’s Conjunx Endura ceremony. 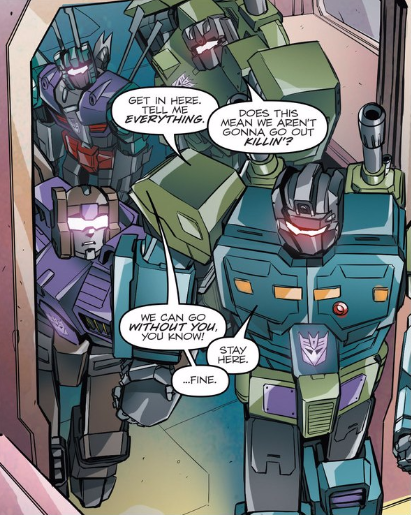 -Somehow bringing together all the femmes from the G1 crew onto one team for an issue. -Breakdown calling out Knock Out for weight-shaming. -Exploring the racial/tribal divides on Eukaris. -Giving Metroplex an avatar so he could move around the city and meet people like a normal ‘Bot. -Metroplex goes to Caminus and has to come to terms with the cut-up body of his most treasured companion. -Tall Tankor and Fat Tankor meet the Micromaster Tankor that turns into a train and they hate him for, like, no reason. He just can’t get into the “tankor clique”. -Elita One takes over Kaon and builds a militarized city-state that threatens to reignite the war. -Revealing Windblade and Chromia’s holo-avatars. 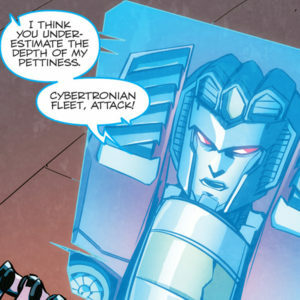 -Having everyone from Cybertron be disturbed by Elita One because she is literally the color of energon so it’s like meeting someone painted in blood. -There were two separate occasions where my husband argued that Fat Tankor should die for emotional impact and I just couldn’t kill him. -I almost took out the name “Fat Tankor” in the final proof of Windblade Vol. 1 because robots can’t be fat and I was nervous, but John Barber insisted I keep it. I want to take a moment and thank you, the readers. You’ve made me stronger, bolder, and better at my craft and the love you have shown this story has been inspiring. I will miss you most of all and I hope you follow me on my next books (because there will be more books) even if they don’t have giant robots. And we all know the first Saturday of May is FREE COMIC BOOK DAY, aka Nerd Christmas! I’ll be signing this Saturday at The Perky Nerd in Burbank, CA from 11am to 2pm. They will have a food truck, other comic pros signing and of course, comics! Come say hi! I’ll be signing and greeting fans at the boom booth, bring your books or purchase them from Boom. Marvel Animation panelists give you an exclusive, behind-the-scenes look at how Marvel assembles acclaimed animated series such as Marvel’s Avengers: Ultron Revolution and Marvel’s Guardians of the Galaxy. Led by Cort Lane (SVP, animation and family entertainment) and Stephen Wacker (VP, current series and development), with several special guests, the Marvel Animation team shares rare insight into the writing process, sneak peeks from upcoming episodes, and tons of scoops on future storylines. I’ll be signing and greeting fans at the IDW booth, bring your books or get them from IDW. Come by, say hi, ask questions and I’ll be happy to sign any of my books. Hope to see you there. 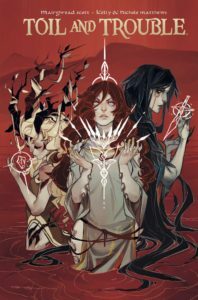 Toil and Trouble Hardcover Now on Sale! ‘Tis Time! The Toil and Trouble Hardcover is now available at comic shops! Yep, you can visit your local comic shop and pick up this beautiful Archaia hardcover boiling over with special features for $29.99. Find your local comic shop here. And if you are in the Los Angeles area, you can meet me in person at A Shop Called Quest tonight for a special book signing event from 6pm to 8pm. Details here. When you get your copy, take a wicked selfie with it and Tweet, Tumbl or Facebook it to me, Mairghread Scott, using the hashtag #ToilandTrouble by midnight on Halloween to be entered to win one special care package that will include a signed and annotated copy of Toil and Trouble filled with notes from me about the creation of the series and the research that went into making this book, as well as a few other super-cool and very secret Toil and Trouble items. I’ll only be creating one of these annotated copies so this is a truly unique prize. Finally, Kelly, Nichole and I have been talking up a storm about the book so you can check out these great interviews below. Laramie Martinez Interviews The Creative Team Behind BOOM!’s Toil and Trouble. Thank you to everyone who has supported this book. I am so happy to share it all with you. 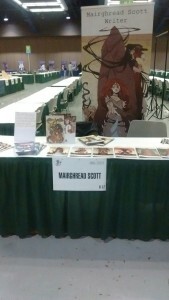 This weekend I will be exhibiting at Emerald City Comic Con! You can find me at table H-17 in Artist’s Alley, right next to Kelly and Nichole Matthews. 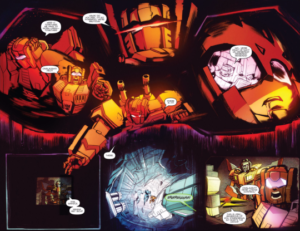 I will have Toil and Trouble issues 1 – 6, Transformers Windblade Vol. 1 and Transformers: Combiner Wars for sale. Signatures on books you bring are of course free. Come say Hi!